Ultimate Calendar is a feature-rich calendar application that lets you keep track of events and tasks, as well as work with date sets using the included editor and switch between the two view modes. Users can switch between the monthly or whole-year views, plus it’s easy to add, edit and remove events from the list. You can also search specific dates using the built-in search and customize the calendar’s display by setting the weekend days and the first day of the week. 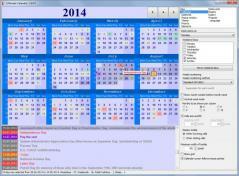 Ultimate Calendar also features a popup window that shows the most recent events and you can customize its aspect by changing the height and width of the window, and/or enabling transparency mode. The application lets you export the calendar table as a BMP or CSV file and the date list can be saved as a TXT or RTF file.